Hines-Sight Blog: A Southern Parenting Tale: Girls Just Wanna Have Fun when the Boys are Away! 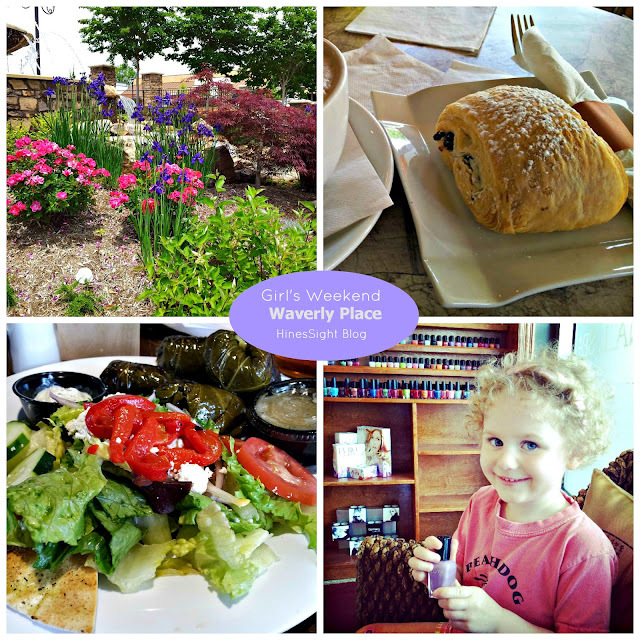 A Southern Parenting Tale: Girls Just Wanna Have Fun when the Boys are Away! It's Memorial Day weekend, and I can't believe that my daughter is already out of school for the summer, and my son has only two weeks left of school. He will be entering second grade. My time lately has been spent at year-end school events. Earlier today, I hosted a reception for a PTA program that I oversee where I match volunteers with children who need a little extra one-on-one time in reading during the school year. I'm not going to share any photos due to school privacy issues, but I met a wonderful woman today. She's 87 years young, and is still actively volunteering for this program. She is a 1944 High School graduate of the same school when it was an African-American High School for the Southeast Raleigh area. She is the cutest lady, dressed to the nines, and says she will be back next year to help more children with their reading. I hope she is. It was a privilege to honor her service to the school today with a short reception. It was a great afternoon. I also wanted you all to know I survived a girl's weekend with this little diva. And yes, that is purple polish she is holding. In my News and Observer column a few weeks ago, titled "Just Us Girls", I wrote that I was a little frightened of parenting her alone for a weekend because she can be a little temperamental and challenging at times. I even compared her to the little girl with the curl in the middle of her forehead who is mentioned in a poem by Henry Wadsworth Longfellow. You can read all about the good and the bad about our Girl's weekend in this week's News and Observer column this week. You still need to click over, but here is a hint. 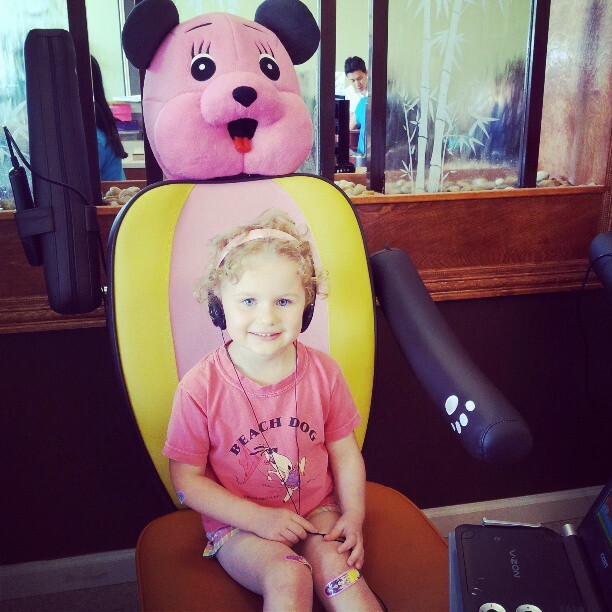 It involved pampering in this cute bear chair at Tre Nail Spa. 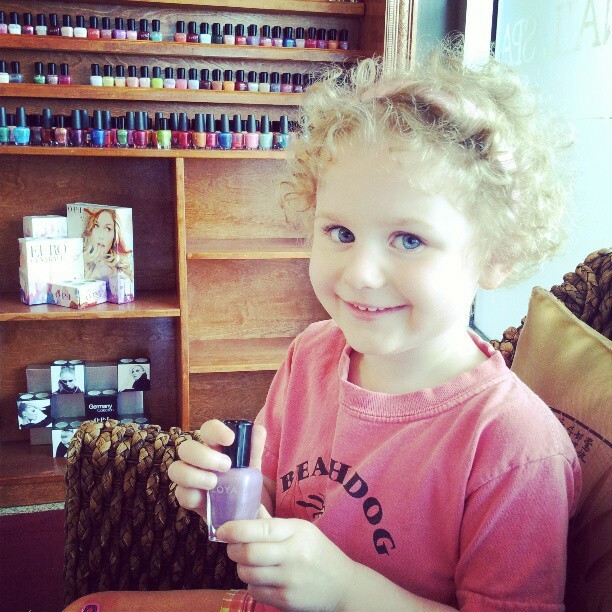 Tre Nail Spa is a lovely nail spa in Cary that also offers some services for children. We did the Princess nail polish change for $8 plus a tip. Isn't that chair adorable? They have two of those in the salon. The entire experience was worth it, but I looked at her toes today and the polish is already off on one big toe. Of course, we won't be doing this pampering often, but for me, this day was about the experience of the spa rather than the polish itself. I wish the polish had lasted a little longer, but a 3-year-old is tough on her toes. 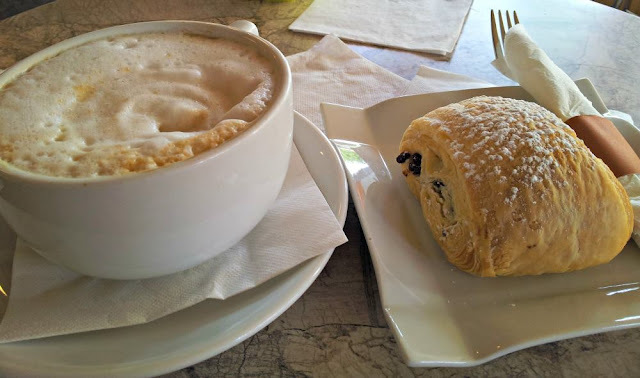 And for me, I indulged in a cappuccino and a chocolate croissant from a favorite place of mine called "Fresca Cafe and Gelato." It's next door to the salon in Waverly Place in Cary, North Carolina. 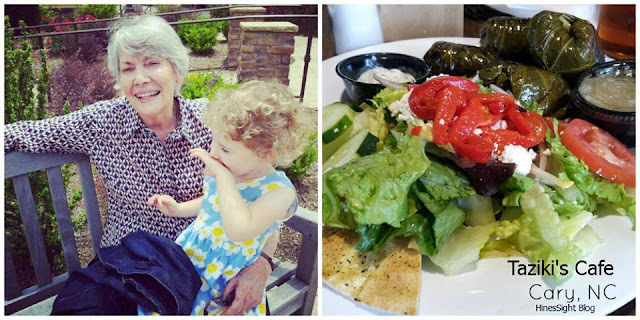 We also celebrated my mom's 78th birthday, and had lunch again in Waverly Place at Taziki's Mediterranean Cafe. I am in love with this casual restaurant, and cannot wait to visit again. In fact, I may go this weekend. It's upscale counter service, but a server does bring it to your table. They have a good selection of beer and wine, and have outdoor seating. My food was delicious. Waverly Place in Cary still doesn't have a lot of shopping yet, but developers are doing a great job filling the shopping center with eateries. All summer, Waverly Place will host an outdoor concert series on Wednesdays. It's going to be a fun summer. Whole Foods is the anchor store, and you will also find a Gigi's cupcakes, and Menchie's Frozen Yogurt. Disclosure: This post is not sponsored. They had no idea they would be featured on the HinesSight Blog nor did I at the time. I guess now they know I have a blog, and it's a good thing I have instagram so I could document this fun.